On Nov. 27th I started the process of covering the elevator and rudder for my Seamaster. This day consisted of covering the ends and trailing edges of the two control surfaces. 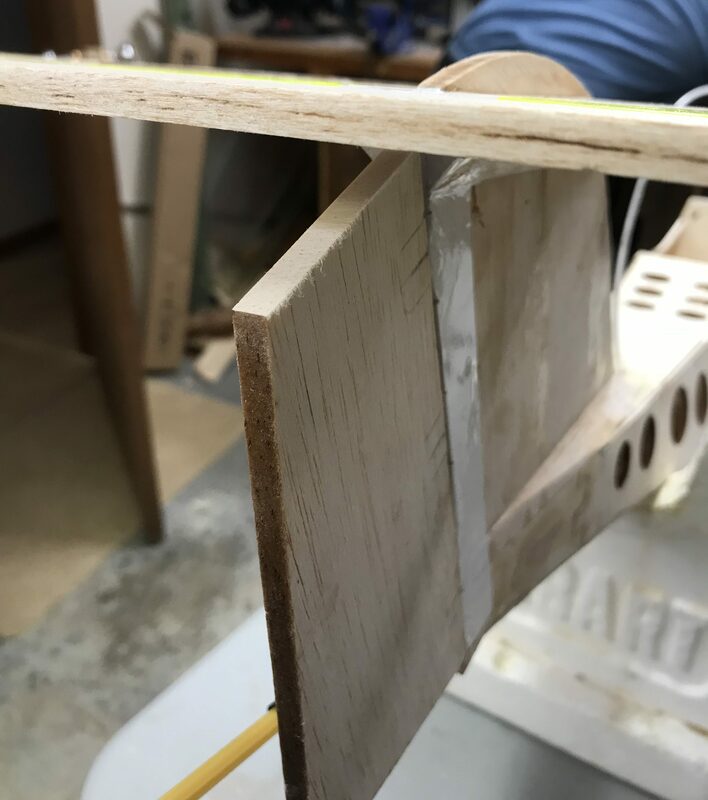 This is done first in order to ensure the edges are properly covered and ensure there is no exposed balsa in the end. 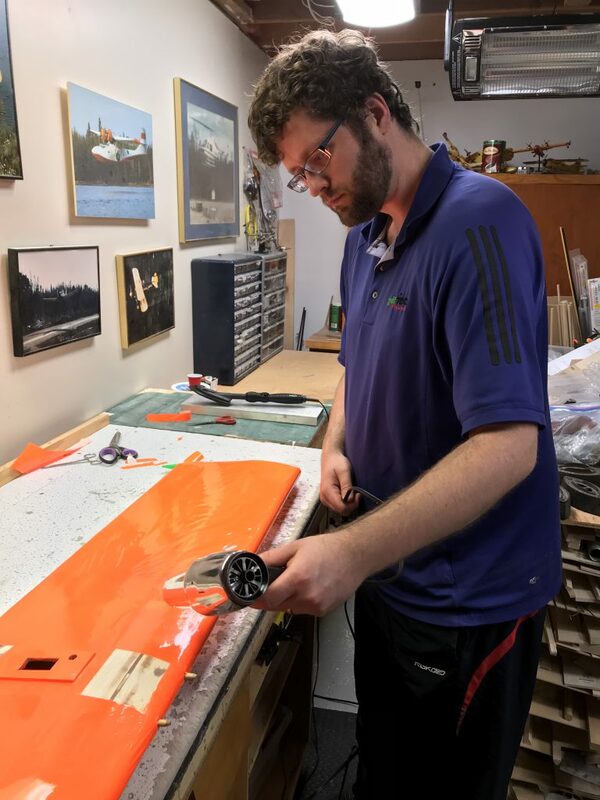 In the next session on Dec. 5th I finished covering by cutting two rectangular pieces, one big enough to wrap around the elevator and the other around the rudder. 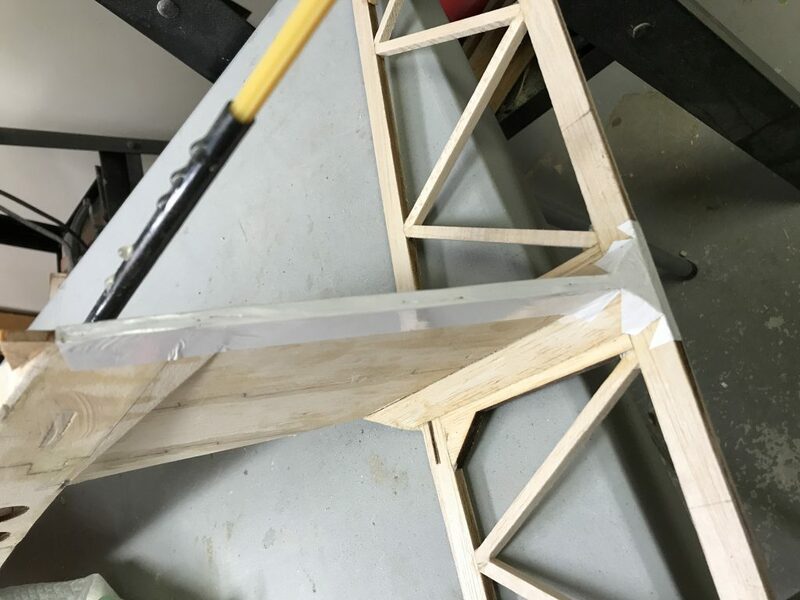 The key here is to make sure it is big enough to cover the widest/longest part (the leading edge in this case) with enough to wrap around the surfaces beyond the trailing edge. The covering process is similar for both. Starting with wrapping the covering around with the leading edge aligned somewhere in the middle you tack/iron down the covering to the leading edge. 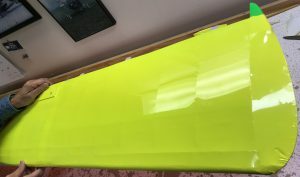 Next you pick a side and iron the covering around the leading edge and to the side of the control surface making sure to work your way from the centre out to the three remaining edges. When ironing at the edges make sure it’s securily ironed at the edge itself and be careful not to have the excess covering touch (cut excess as you see fit). Once done the one side you can trim the excess covering along the edges before proceeding. Next, flip the elevator or rudder over and repeat on the other side. Starting with rolling the iron over the leading edge and continuing to iron the covering to the other side of the surface starting at the centre of the leading edge out into the middle of the side and working your way out to the three remaining edges. Then trim excess covering. This process left me with covered control surfaces. On Nov. 26th I covered the fin of my aircraft. This entailed cutting to pieces with some excess for each side of the fin. I ensured a straight edge was used along the bottom and top. I ironed along the top edge first and then worked my way across the surface and folded the one side around the front. I incurred a few more wrinkles then I would have liked, but pick my battles I must, lol. You can still see bits of balsa sticking out at the bottom, but this will be covered when doing the top of the fuselage as it will be cut around the fin and will go up a bit as well as down each side, tapering off. I do apologize that my last few posts haven’t been ‘as good’ as past ones but I have been playing catch-up while I’ve had some down time. On Nov. 20th I focused on covering the bottom of the stabilizer. You can see the stop point for the day with the bottom of the stabilizer covered in the featured image above. Above you can see the top of the stabilizer (bottom of the covering) I ironed in place. Below you can see the bottom of the stabilizer (one side) covered). 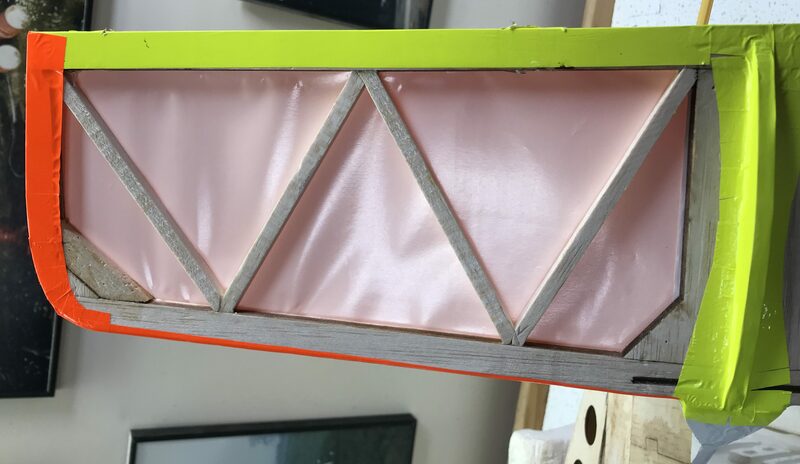 The first step was to measure it all out and cut a piece of fabric over-sized with a straight edge I could put the the inside along the triangle block to have a cleaner finish. I then worked the covering around the leading edge (which was previously sanded to be rounded). You can see me doing this in the picture at the bottom of the post. I made sure to iron from the inside out towards the leading edge and rounding out around the edge to get a smooth finish. Once that was done I tacked the edges to the bottom of the stabilizer and worked my way around the outside ironing the covering to the balsa of the stab, ensuring I pulled the covering tight as necessary. This left me with the finish below. Not quite done yet, now that I had the edges of the covering sealed (ironed to balsa) I used the heat gun to shrink the covering. This was done by starting at one of the ends and ensuring I’m always blowing towards the center (away from the covering stuck to the balsa already) and constantly moving and working my way around. You do not want to stay in one place to long or else you will burn a hole through the covering and have to start over. This provided the ‘crisp’ finish you see in the image at the top of the post. On Nov 17th I finished covering the wing and started covering the tail of the aircraft. You can see in the image below that I covered the seems (joints) along where the triangle stock is in place helping support the stab to the fin. I do the seems first to help keep fuel, etc. from getting in and eating away at the glue, damaging the wood, etc. I also try and do it strategically to limit the places where air can get under the covering and peel it away. 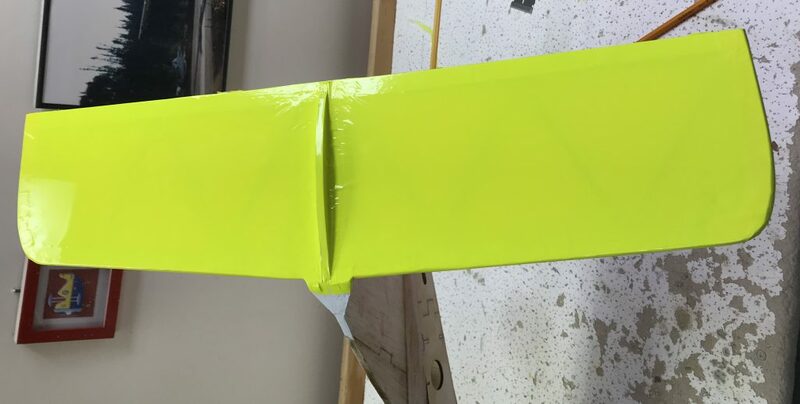 Once the joints were covered I wrap the excess around the leading edge, see aforementioned point about air movement and then trim it from the trailing edge since this has already been covered. You can see the in feature image of the post that I have started covering the stabilizer. I focused on the convex curves this day (Nov. 18th). This is slow meticulous work as it involves a lot of tiny cuts of the covering along the curves so that you can get it all covered and limit (in an ideal world eliminate, lol) the wrinkling of the covering. I did the outer edges in orange to match the bottom and I did the convex curve on the top of the stab (which will be for the control wire to fasten to and flow over for controlling the elevator) in yellow to match the top. Top and bottom of the stabilizer are going to match the top/bottom of the wing. On Nov. 6th I finished covering the bottom of the wing by cutting two pieces to fit down the center, seen below. 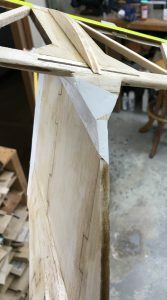 The first wraps around the leading edge of the wing and goes down to the edge protrusion and the other goes from bottom of the protrusion to the trailing edge where it was trimmed off to be flush with the edge. This completed covering of the bottom of the wing. After that, I started work on the top of the wing by doing the piece going down the center, seen below. I also got the covering for each wing panel cut this day as well. The next time, Nov 7th, I spent a couple hours covering the top left panel of the wing, seen at the top of this post. In order to do this I followed a very similar process to what I did for the bottom. The only difference comes to when wrapping around the wing tip I cannot fold it over onto the wood. Instead I did cuts accordingly and ironed it to the very thing wing tip outer edge. I then did my best to cut the covering along the edge as neatly as possible. My one concern is how everything is wiring up as I have run nothing prior to covering and am taking Peters word that it is going according to plan since I have had nothing ‘official’ to look at and follow along the way. 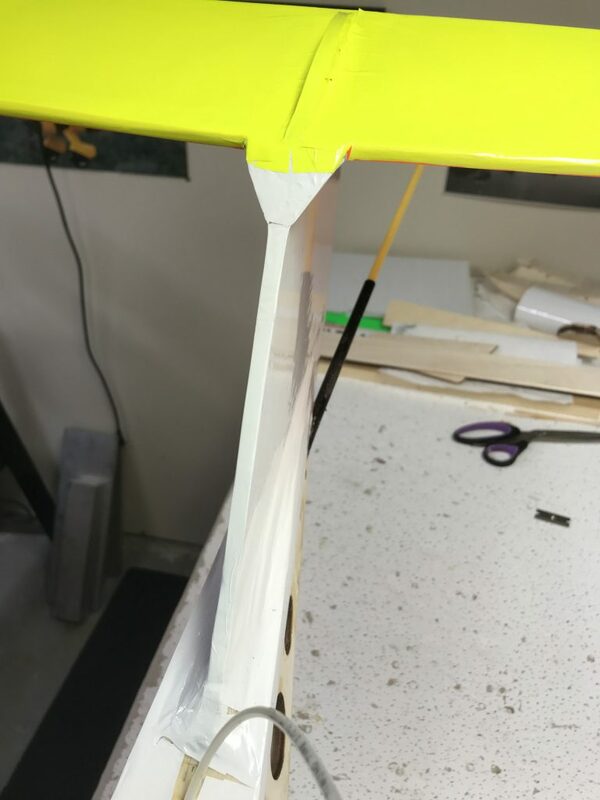 My best guess is that the servo is going to mount into the bottom of the wing somehow and the push rods are going to go along the outside of the wing for controlling the ailerons. Perhaps this is to help ensure no water gets in and a better seal between the wing and fuselage? On Oct. 27th I continued work on the wing and it took me 2 hrs to get the covering of one panel done, seen below and I completed the other half on the 28th seen in the image above. The first steps are to get the piece of covering sealed all around the edges. This includes rolled around the leading edge a bit to prevent wind from getting underneath and pulling it back along with tacking it along the trailing edge and to the center sheeting. This wing provides an additional challenge due to the wing tip design. When cutting I need to ensure I had a good additional 5 inches past the outer edge to both hold as well as to fold over the wing tip. After tacking the covering to the outer rib it was pulled around the edge of the wing tip and cuts were made to allow the covering to fold around the edge with the least amount of wrinkling and ironed to the edge. The folded pieces were ironed to the other side of the wing tip, seen below, to provide additional strength for the covering in hopes it will not peel off in the wind! Once that was done it was time for the heat gun. Started by shrinking some of the covering in the open space of the wing tip (between outer rib and the ‘fold over’. I then worked my way around the main wing panel ensuring the heat gun is always pointed toward the center of the wing panel as I work my way around. This is because you do not want to hit the holding edges with direct heat causing the covering to let go as then you’ll have problems and need to start over. Essentially at this point I keep working my way around and around, ensuring I do not stay in any one place to long at the risk of burning a hole through the covering. I keep checking from various angles so I can see where there are ripples/slack in the covering that still needs to be shrunk with the heat gun. This process was repeated on Nov. 4th to do the bottom wing panel on the other side. 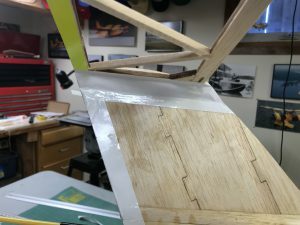 Using heat gun to shrink covering over wing. 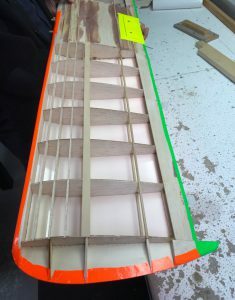 Yesterday I continued working on covering the ailerons as well as ensuring a fit between the rudder and elevator. 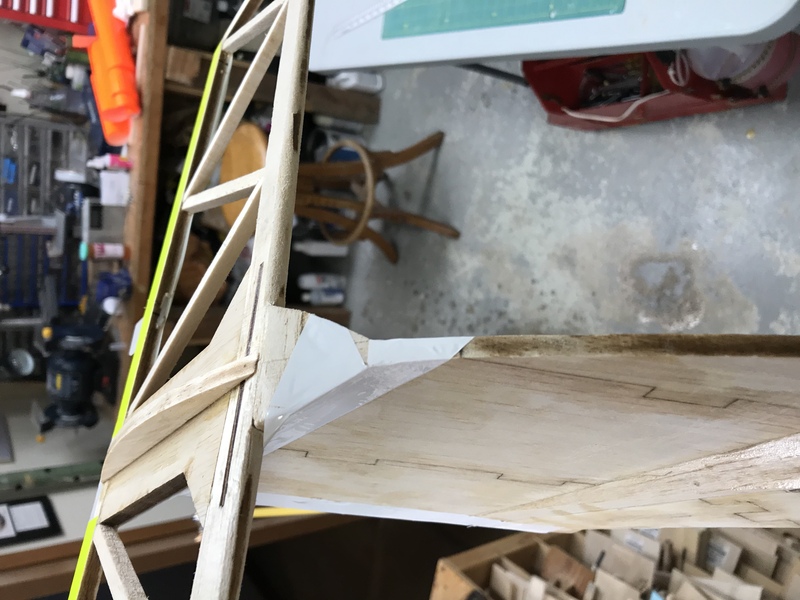 Prior to fitting the elevator and rudder I needed to V the ruder and elevator so that when hinged to the tail of the fuselage side to side movement of the rudder would be possible as well as up and down movement of the elevator. To ensure the elevator has enough down movement I had to sand the top of the elevator at an angle slopping from leading to trailing edge, seen below. I finished the night by covering the ailerons. This took a quite a bit of time. I was working on the aircraft for about 2.5 hrs this day. I measured out enough covering to go around the entire aileron in one piece. In this case it worked out to 5″ wide. 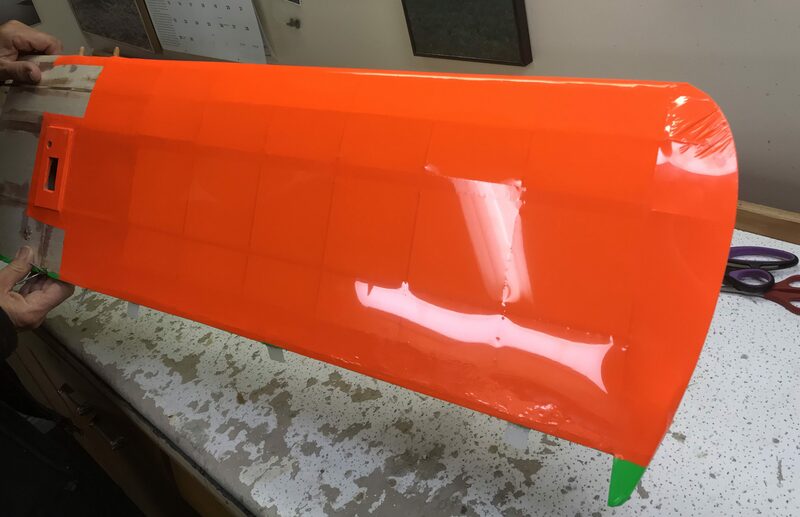 I started by ironing a strip down the one side of the aileron and wrapping it around the flat trailing edge, ironing it down as well. 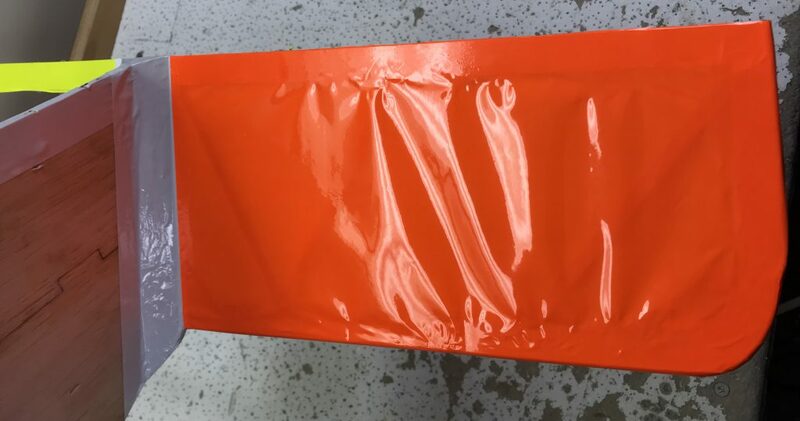 Then folding the covering around and pulling tight I ironed it to the one side of the aileron. I subsequently started pulling it around the leading formed edge tacking it down. I then pulled it tight across the other side and tacked it down near the edges and used a heat gun to shrink the covering to the other side as using the iron in this case would not work and cause plenty of wrinkles and havoc! 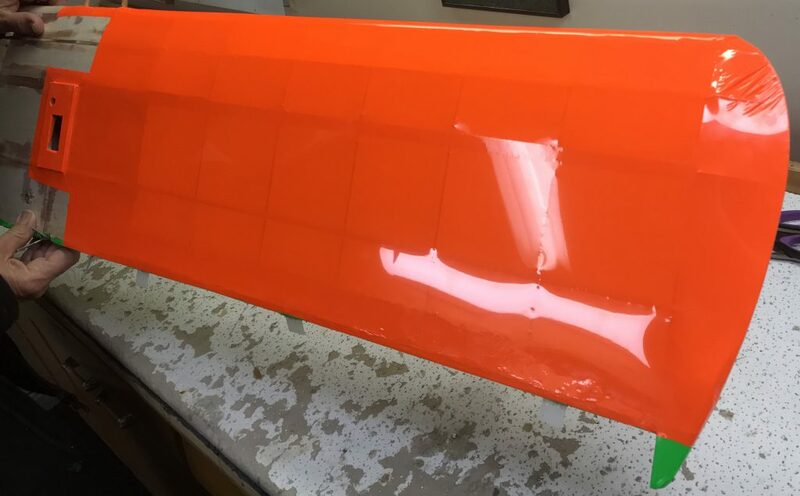 Once I did what I could with the heat gun I used the iron to shrink up any loose spots and ensure the covering was adhered to the surface of the aileron. This process was repeated for the other aileron. Since the covering once it cools may slacken in places I haven’t cut the slots for the hinges yet and will have to inspect at the beginning of the next session. That concluded another building session at Peters. Prior to heading home I visited for a while as its going to be Friday at the earliest that I get to head over again to continue working on the aircraft. Covering is a slow, but therapeutic, process to get it done at least somewhat decently I am hoping :). The therapy part is in it takes my mind off work and other things for that time, lol. Part of why I enjoy building, plus it keeps me in the hobby throughout the off season. On Oct. 19th I did some more covering, as will be the case for many sessions to come :). This particular day I covered the trailing edge of the stabilizer in caution yellow, seen above, which will be the color of the top of of the stab and wing, as the plan is to match them. Once the trailing edge was covered and found the hinge slots and cut them out. 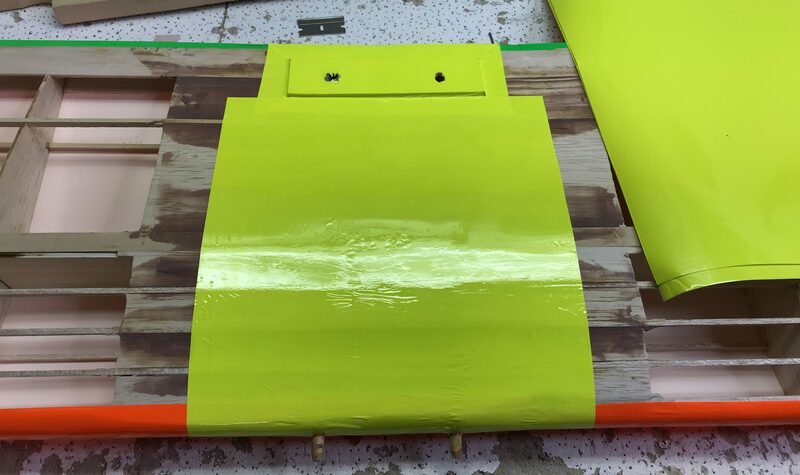 The next task was to finish covering the aileron tips, seen below. This time I folded the ends down first followed by the wider pieces along the side and folded over the edges. I think overall gave a better look even though it typically folded right around. 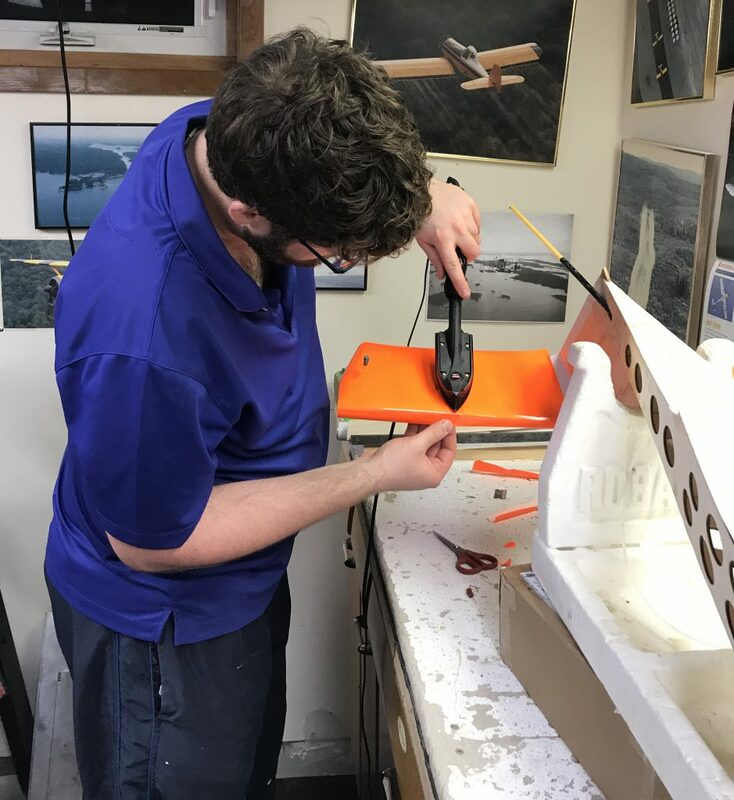 Yesterday started with seeing what Peter had down, which was installed the hinges for the ailerons onto the trailing edge of the wing. This involved making a two toothpick sized wholes per hinge as well as drilling a hole for the toothpick into the hinge itself. Then the hinges were glued inside the slot with the toothpicks pushed through the pre-drilled holes. 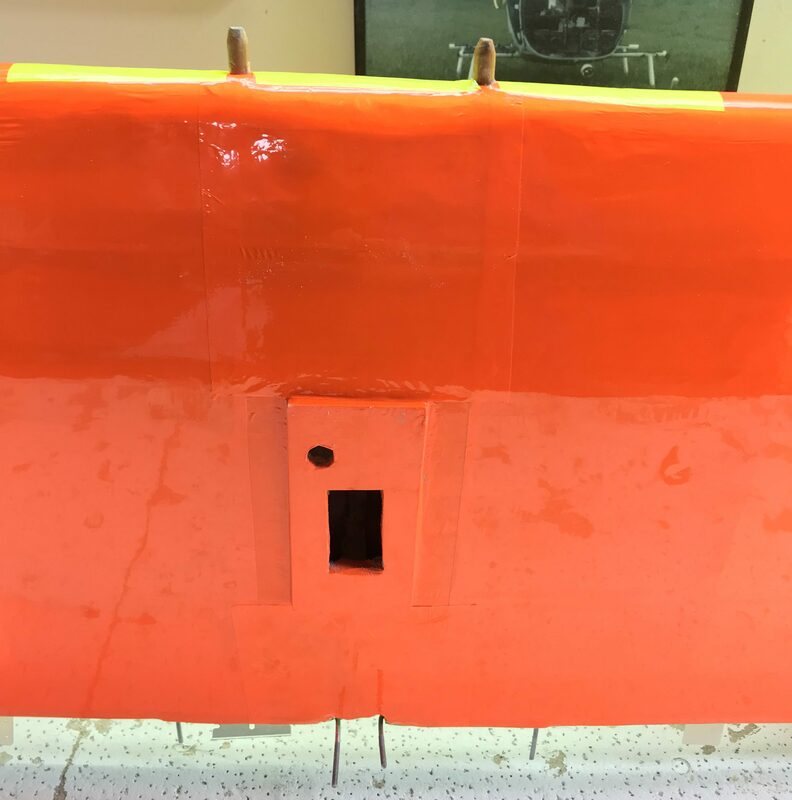 This was done to provide greater strength to the hinges to help prevent them from disengaging from the trailing edge of the wing during flight. Upon my arrival to complete the process I cut off the excess toothpick ends and then sanded the ends to be flush with the trailing edge sheet. This day involved the most sanding I’ve done in a while as I touched up spots on the fuselage in the fin areas and then in rounding the leading edge of the stabilizer, seen in the image at the top of the post. The fuselage of my aircraft is going to be white, like on my previous build. Essentially I am trying to standardise my colour scheme so no matter which aircraft I am flying top and bottom colours will be the same (exception to this may be when I get into real world models, i.e. Thunderbolt or P51 Mustang, and want to be true to the aircraft. That is why, seen below, I did the trailing edge of the fin in white and then slit the covering where it covers the 3 hinge slots. For simplicity due to the stab/tail design I ran the white right up and over the top. This pieces still requires some touch up before proceeding with covering the tail end.